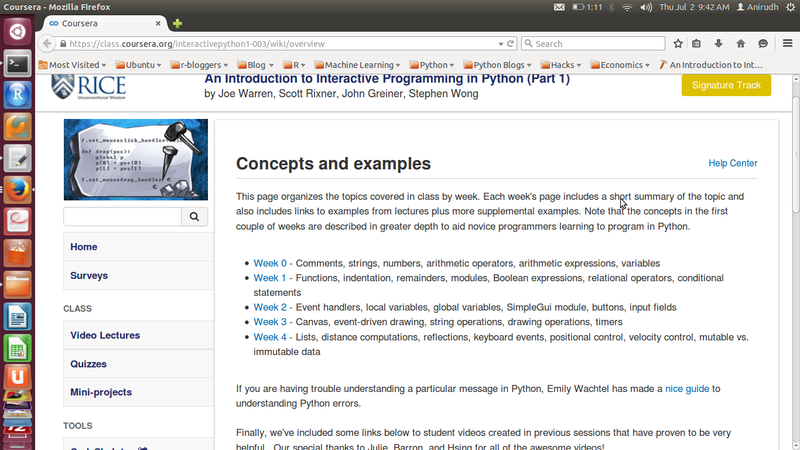 This class (Part 1 of a 2-part course on interactive programming using Python – and the first course of the Fundamentals of Computing Specialization offered by RICE Unviersity) was an excellent introduction to programming because of its focus on building interactive (and fun) applications with the lessons learned each week. 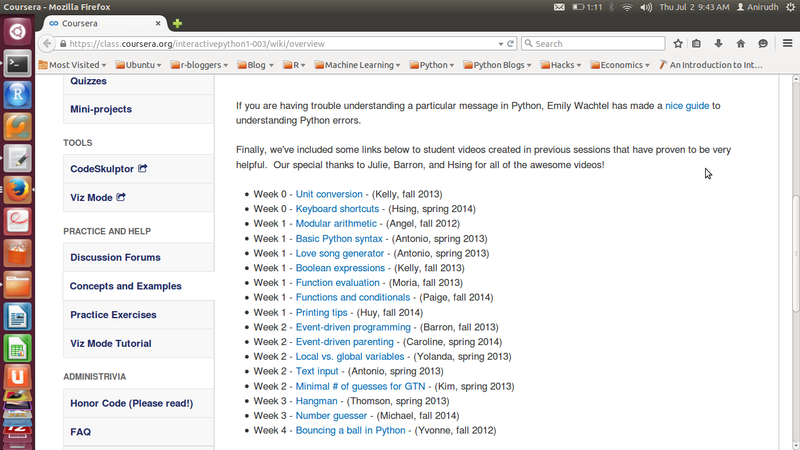 Most introductory coding classes start with text based (boring?) programs, while all through this course you’re required to build a series of projects that get progressively complicated with every passing week. I’m not to be mistaken to be trashing conventional pedagogy, but then again, how many gifted coders do you know who learned to code after completing all the exercises, cover-to-cover of some programming textbook? 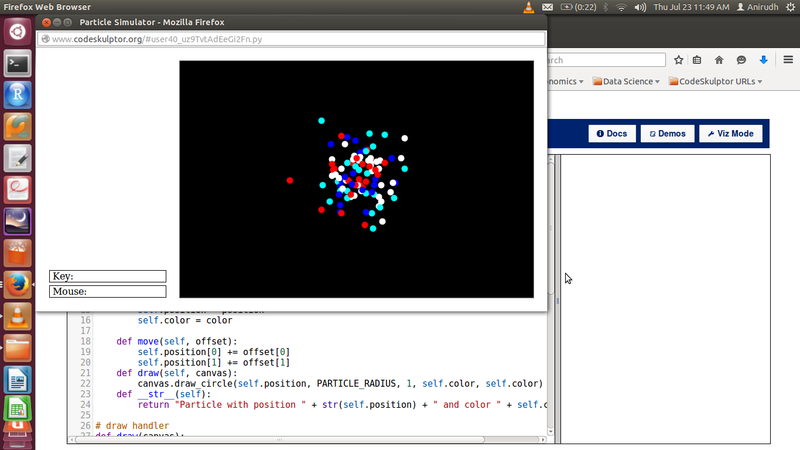 The best way to learn to enjoy coding would be to build interactive stuff, and this course scores full points on that. 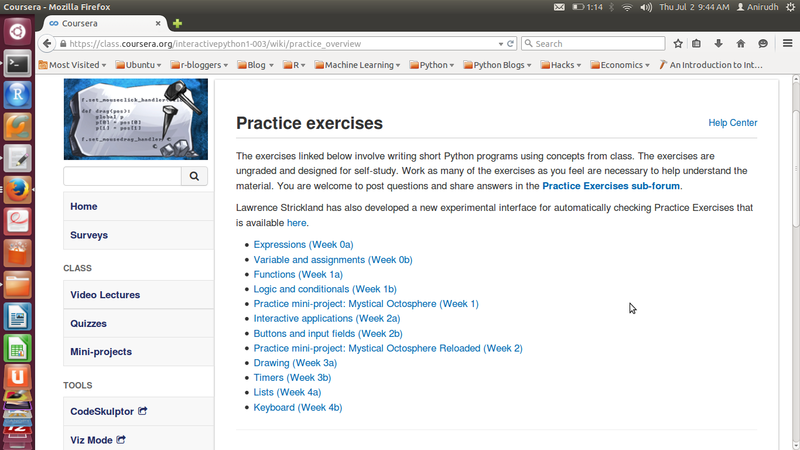 The mini-projects / assignments during the course are implemented on a cloud-based environment called CodeSkulptor (built by Scott Rixner, one of the instructors for this course). I found CodeSkulptor unique, in that it allows you to share your code (because it’s browser based) with just about anyone with an Internet connection and makes you work with a graphic user interface (GUI) module similar to Pygame, called Simplegui. It also had a debugging tool, called Viz Mode that helped visualize the process. It eases the task of debugging your code and you’ll realize how cool it is as you start using it more. Since the course mini-projects were peer-reviewed, evaluating other people’s code also became a more straight-jacket affair, as everyone has their code on the same version of Python. This ensures that the focus is on learning to code, without wasting time on the logistics of programming environment (tuning differences in versions or IDEs). 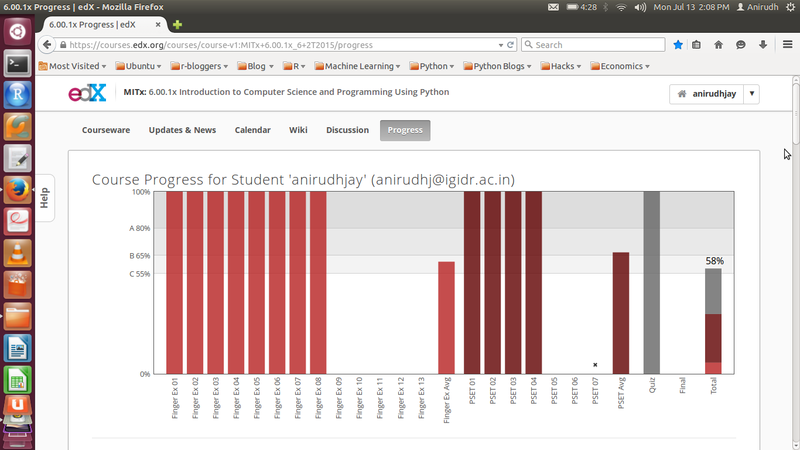 I especially enjoyed peer grading – for each mini project we completed, we had to evaluate and grade the work of 5 others. This was very rewarding – because I got the opportunity to fix bugs in others’ code (which makes you a better coder, I guess) and also got to see better implementations than the ones I had coded, further enriching the learning experience. Indeed, the benefits of peer grading and assessment have been well studied and documented. 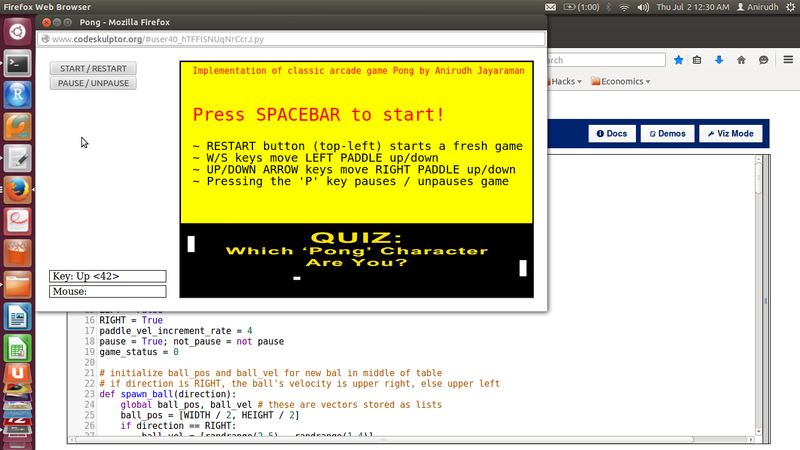 Of all the assignments, the one I loved the most was implementing the classic arcade game Pong. You could try playing a version of the game I implemented here. It is a 2-player implementation, but you can play it as a single-player game, only if you imagine yourself to be answering this somewhat cheeky question! 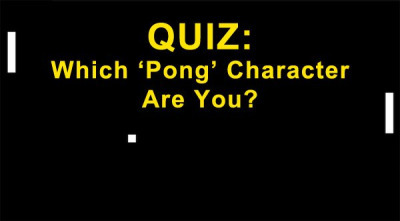 Which Pong character are you? Left or Right? 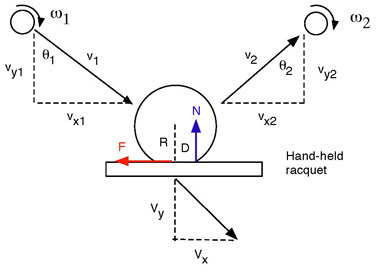 – Rock Paper Scissors Lizard Spock: A simple implementation played with the computer. This project covers basics on statements, expressions and variables, functions, logic and conditionals [I’m a huge fan of The Big Bang Theory, so I was obviously eager to complete this game. Instead of a series of if-elif-else clauses, this implementation used modular logic, all of which is taught in a really fun way. A great way to start off the course]. – Guess the Number: Computer chooses a random number between 1 and 100 and you guess that number. 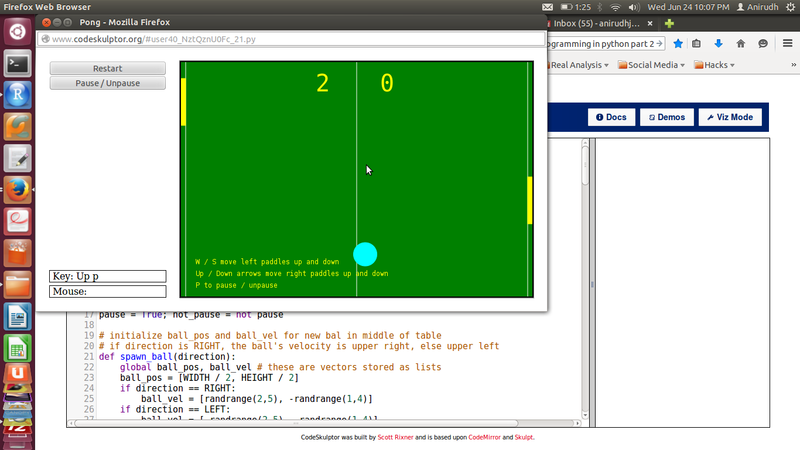 It covered event-driven programming, local and global variables, buttons and input fields [This game although fun, might have been more interesting to code if the computer had to guess the number that the player chose, using bisection search]. – Stopwatch: This was the first project that used a graphic user interface, using some modular arithmetic to get the digits of the ticking seconds in place. A game was also built on it where the player had to stop the watch right at the start of a second to score points. This game tested your reaction-time. It covered static drawing, timers and interactive drawing. In an interview with the founders of this MOOC, who spent they say that they spent over 1000 hours building it (Part 1 and Part 2 combined, I guess). That’s an awful lot of effort and it all shows in how brilliantly the class is executed. The support system in the class is excellent. You’ll always find help available within minutes of posting your doubts and queries on the forums. 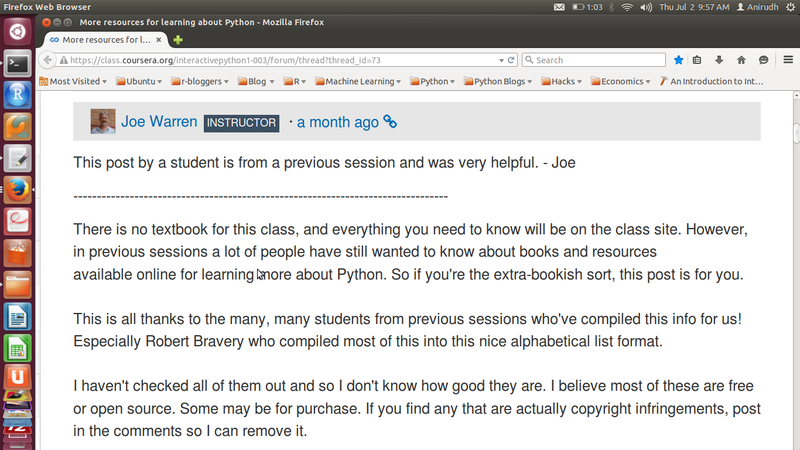 I’ve seen Joe Warren (one of the main instructors of the course) replying to forum posts quite regularly. In addition, there was enough supplementary material in the form of pages on concepts and examples, practice exercises, and video content created by students from previous iterations of the class to better explain concepts and aspects of game-building, improving upon the lecture material. PS: In one of the forum threads, Joe posted a list of resources that could be referred to in addition to the class.